Can you imagine having a racket that scores a perfect 10 in terms of defense? That’s exactly what the Yonex Nanoray Z Speed offers you. If you opt for a defensive style, then this racquet is everything you are looking for. It’s expensive, yes, but its performance is well worth it if you are looking for something to take your defensive game to the next level. If that’s your sort of thing, then this one is the perfect match for you. Let’s review the advantages and disadvantages of this product by Yonex. Fastest racket on Earth. Its supreme speed will bring you an unfair advantage. Recommended for defenders. It comes with everything you need for a superior defense. As advertised, the Nanoray Z Speed is the fastest racket on Eart according to Yonex. And well, they are not wrong, because they have equipped with the latest technology in order to bring you a supreme speed and an unfair advantage over your rivals. Want to learn more to see if it’s a good choice for you? Then just come with me and read the rest of this review. First off, it looks very well in terms of aesthetics. The combination of black with red in the frame and some scarlet tones make it look beautiful, lethal and modern. One of the best designs I’ve seen. It scores a solid 10 out of 10 in this regard. Now, let’s review the technology, design and construction of this racket. A faster and smoother swing. Everything in this racket has been engineered to produce a faster and smoother swing (+10%). This will bring you better clears and smashes in the game. X-Fullerene for superior repulsion power and amazing stability. 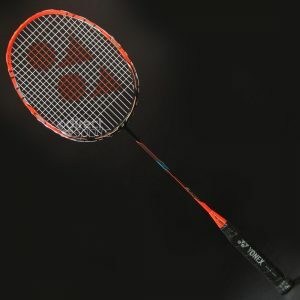 Do you want more repulsion power and superb stability? Then this racket will give you so thanks to its construction with X-Fullerene, a cutting-edge technology found in great rackets like the Nanospeed 9900. Sonic Metal. This incredible piece of tech is located in the lower part of the frame, which increases repulsion power, makes an aggressive sound and improves the snap back effect for better shots. In this sense it’s similar to the Voltric 70. Unfortunately, it’s a bit expensive. Therefore, if you are looking for a badminton racket discount, you should check out rackets like the Nanoray 10 or Nanoray 20. I need to dedicate a section to this feature, because it’s very important to talk about it in detail. First off, its design is unique. Moreover, this frame is built with EX-HMG (High Modulus Graphite). Why is this important? Because this material – which is the most powerful and elastic – along with the perfect design will bring you superior repulsion power, amazing acceleration and more power for every single shot. The Snap Back Zone design makes the frame thinner at the midway point on both sides of the head. This excellent design makes it possible to exploit the maximum potential of EX-HMG to bring you a better game performance. Moreover, this racket is using a revolutionary grommet pattern known as Horizontal-A Concept, which makes its frame the smallest. This particular pattern creates an enlarged sweet spot for more successful shots delivered with plenty of power. As you can see Yonex has done an amazing job with this racket. And now it’s time to review its performance in the game. It’s time to review how well it performs in the game. I like to review clears right off the bat, and honestly this racquet does an amazing job with them. They go easy and far without much effort, and it’s all due to its incredible technology. As expected, thanks to the design of the frame and Ex High Modulus Graphite, the smashes go far and strong. It’s close rival to Voltric racquets in fact. It performs very well in drives. But if you really want to make it shine, then you need to try defensive drives. It’s a great racquet for defensive-style players. Thanks to its fast reactions it has proven to be excellent in terms of defense, and when countering smashes with drives or lifts it really shows its real potential. In the front-court it has a pretty solid performance. Thanks to its incredible speed and excellent design you can neutralize even the trickiest shots. And in terms of offense, it delivers very solid and powerful net kills and net shots. It’s easy to see why this racquet is truly amazing. Its performance is top-notch thanks to the incredible technology it contains.